Over the past few years I’ve had the pleasure of talking with Erik Mondrian about virtual worlds many times. We both have a passion for Second Life as a place where interesting things happen and a place to explore (he as a fox). This curiosity also developed into a deeper study for both of us. In Erik’s case, it is an MFA at California Institute of the Arts in the USA, in mine a doctorate at Lancaster University in the UK. We are both fascinated by what comes out of Second Life – the creativity and indirectly those involved – rather than being sociological or psychological studies of individuals. Consequently, the videos are a thesis produced out of Second Life, rather than being a thesis about Second Life. 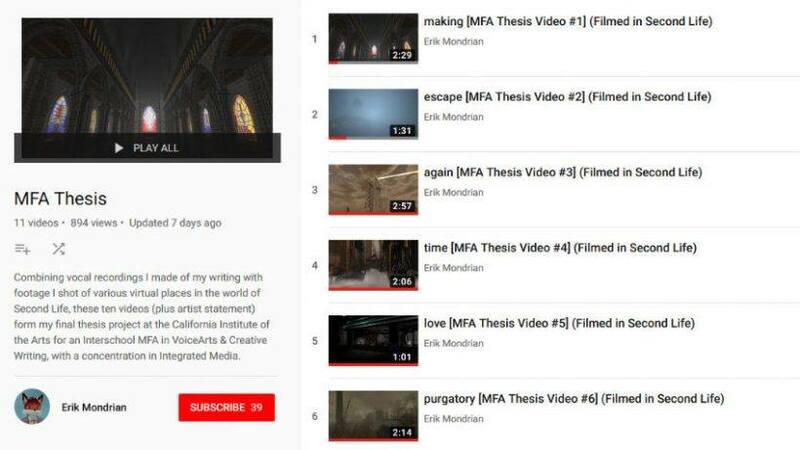 As part of his submission, Erik produced ten videos and an artist statement, which I watched through all in sequence. Second Life, and the internet in general, is commonly seen as a visual space, with added music. However, there is no such thing as a purely visual medium, it is always mixed. WJT Mitchell put it a little stronger in a paper back in 2006: ‘There Are No Visual Media’. Erik’s MFA is in VoiceArts & Creative Writing, with a concentration in Integrated Media. As a result, his approach is to bring together voice, words and visuals, though not as a straight narration. I particularly like the way his words and the visuals are combined in different ways. In some, they are directly related, in others it is not immediately apparent. I really appreciate this fluid relationship. But more importantly, these aren’t stylised ‘machinima’, but inventive and passionate in a personal way. I’ve come to the view that ‘machinima’ is lost as a term for an artform in the constant landslide of gameplay run-throughs. This is not right or wrong, but how things have evolved. However, the creative stuff now has to find a different space, often having to hold its own in the field of video art. Below is his first video in the series. If you go through to YouTube, you can find the other ten videos. Enjoy!